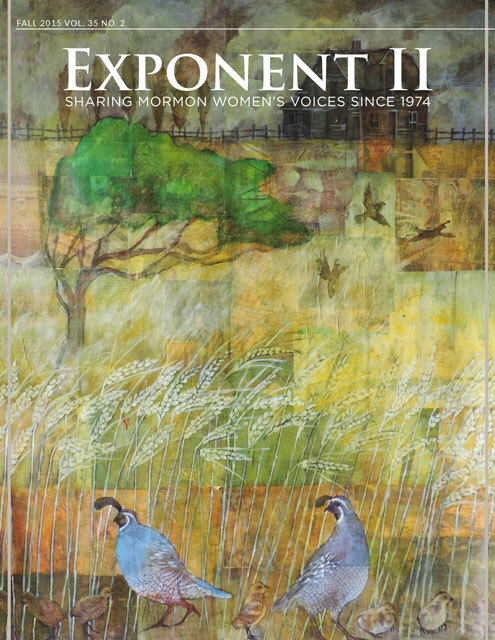 Exponent II's Classics: What's a Mother to Do? I’ve been jogging every morning for ten months, three weeks, and two days. I’ve had to fight off mad dogs, ignore jeering high school students, brave blinding snow storms, endure twelve degree weather. I’ve tripped through ankle deep chuck holes, inhaled stunning odors on garbage days, and worst of all, had to slog uphill the last half of the way. I’ve staggered home exhausted. But I was convinced it was owrth it. I could feel my blood circulating, my muscles toning, my heart strengthening: at last I had found a way to improve my health. Then yesterday an orthopedic surgeon told my husband there is nothing worse on feet and knees than jogging. Today the representative from the March of Dimes stopped by. Thoughout each pregnancy I have been conscientious about having an egg every day. One pre-natal pamphlet firmly stated: “Have at least one egg a day.” So, to be thoroughly healthy, most days I had two. Now after three pregnancies of enduring slithery whites and runny yokes day after day, I read in the new March of Dimes handout that one should never have more than four eggs a week. I remember how I felt after two years of dragging out of bed every morning to whip up an Adelle Davis pep-up—milk and raw eggs—for the kids. Stringing slimy egg white from the blender across the cupboard to throw the shell in the garbage wasn’t too much to do in the name of health. I felt secure in the knowledge that the children started off each day with a pep-up. I even put it in the baby’s early morning bottle. I may have had my faults as a mother, but I knew I was doinga an A#1 job as far as nutrition was concerned. Than I attened a lecture by Harvard’s Jean Meyer to have my efforts applauded. Instead, he said raw eggs should never be eaten because of the extremely high risk of salmonella poisoning. The next day a doctor friend told me he was so sensitive to this risk he wouldn’t even let his children eat cookie dough because of the raw eggs in it. After five years of infertility—that’s 60 months of intermittent bawling—after every conceivable test and even major surgery, my doctor prescribed stilbestrol. It worked. Blessed be stilbstrol. I immediately contacted everyone I could think of who was having infertility problems so they could rush to their doctors and start taking stilbestrol. Everywhere I went I praised stilbestrol, feeling all the world’s problems could be solved with such miracle pills. Our daughter was a year old when the news spread about the cancer probabilities for female children from stilbestrol-taking mothers. I washed our son’s hair with pHizoHex every morning for over a year. It was expensive and no fun at all to use because I never could get enough suds, but I used it. He deserved the germ-free best. Then pHizoHex was suddenly whisked off the market for fear it might cause brain damage in infant children. I worry about not giving my kids enough protein, yet every time I give them a piece of bologna I feel like I’m handing them a nitrite sandwisch. When we drink pasteurized milk I wonder about the destroyed nutrients and enzymes;l when we drink raw milk I’m sure we’ll all come down with rheumatic fever. The pediatrician prescribes fluoride vitamins for our kids. My tennis partner assures me that fluoride is a potential poison. Each night as I faithfully clean my teeth, I can’t help but wonder if in five years the American Dental Association will find dental flossing detrimental to teeth and gums. Since we got a wheat grinder for Christmas, it will probably soon be proven that stone-ground wheat products are a main cause of colitis. And with our polluted air and aerosol aprays I’m worried that it won’t be long before the Respiratory Disease Association recommends against breathing. If the cholesterol level in my blood will remain low enough, I’m going to walk, not run, slowly down to the cancer detection clinic on the way to buy my daughter some black patents. I love this article. I think most of us can relate to trying your best to do what’s right, only to find out later how wrong you were. Delightfully (and frighteningly) contemporary for a 30-year-old article. Thanks for typing this up for us. Just goes to show you that keeping track of all the things that are going to effect us and our families is a full-time job; time better spent getting to really know and love those family members.